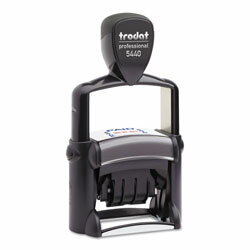 Save space and money with this versatile dater that is actually five stamps in one! Use the date alone or add one of the four interchangeable phrases. Steel frame construction for heavy-duty use. 10 years of dates. Delivers up to 10,000 impressions. Traditional Stamps from U.S. Stamp & Sign! 749 In Stock today.